There’s nothing quite as deliciously spooky as sharing a spine-tingling story in the dark. What better way to do that in the month leading up to Halloween than to gather the family and listen to a scary audiobook together? 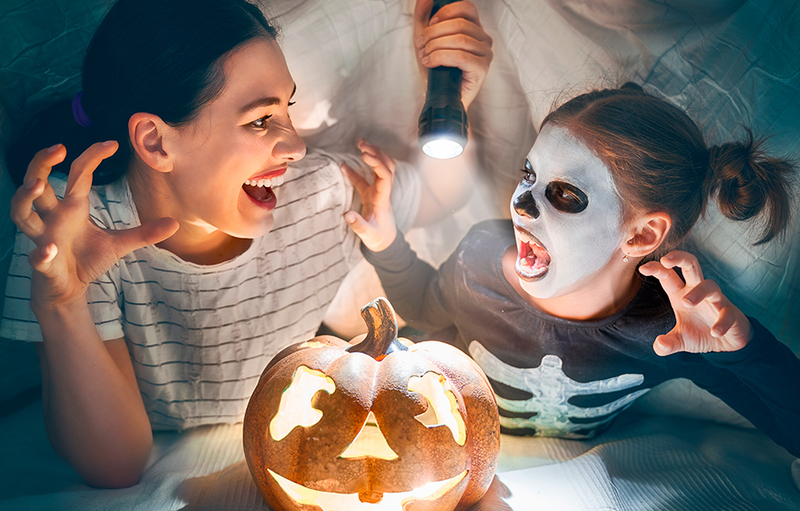 So turn on an audiobook, turn off the lights, and have a flashlight ready for a frightfully fun night of storytelling! Eleven-year-old Ollie steals a book from a crazed woman trying to get rid of it. In it, Ollie discovers a chilling story about siblings who made a sinister pact with the “smiling man.” On a school field trip to a secluded farm, she stumbles upon graves of the very people she’s been reading about. To top it off, the school bus breaks down on the way home, and the bus driver tells the kids, “Best get moving. At nightfall they’ll come for the rest of you.” Ollie and two of her friends heed his advice and embark on a hair-raising journey. Set in White Cemetery, an actual graveyard outside Chicago, each of these nine short stories takes place during a different time period. Sit by a vampire’s tomb at midnight. Get locked up with mummies in a dark museum. Join a mysterious boy who lurks in the shadows at Saint Michael’s. Listeners will get a thrill hearing these spine-chilling tales! An ASG (Averagely Spooky Ghost) is hiding out in Tom’s cellar…because it’s being haunted by a way bigger and badder Incredibly Revolting Ghost (or IRG). Luckily Tom’s grandma’s best friend happens to be a world-famous ghosthunter. Listen to an excerpt Ghosthunters and the Incredibly Revolting Ghost! There’s a place beyond this world where spirits tell their tales—stories that ended too soon, or don’t end at all—and Marcus and his friends have found the key to unlock the Library. After creepy ghostly encounters, they must use the key because the Library may hold answers, but if there’s an unfinished mystery, the three friends will have to complete the story themselves…. Crow isn’t like the other kids. He stinks. He’s got maggots. And he hasn’t been able to sleep in years. Not since waking up from death. But worse than the maggots is how lonely Crow feels. When Melody Plympton moves in next door, Crow can’t resist the chance to finally make a friend. Now he may even have a shot at getting his life back from the mysterious wish-granting creature living in the park. This collection includes timeless classics: Nighty-Nightmare, Return to Howliday Inn, Bunnicula Strikes Again!, and Bunnicula Meets Edgar Allan Crow.